Ralph Dunlop of The Courier-Journal has a great profile in the Christmas Day paper of "perhaps the most active, relentless and combative mine-safety advocate in Kentucky, at least among working coal miners," Scott Howard of Harlan County. If you have time on this Christmas weekend to read only one political analysis of the health-care issue, we recommend the thorough, evenhanded and salient piece by John Harris, editor in chief of Politico, and reporters Alexander Burns and Josh Gerstein. It says both parties have staked their near-term and maybe long-term future on the issue, and offers scenarios that would benefit each party. For most of the time since the banking crisis hit, more than a year ago, the Institute for Rural Journalism and Community Issues has encouraged community newspapers to report on the health of their community banks, using easily available public information gathered by federal regulators and public-interest organizations. We have no idea how good the coverage has been nationwide, but we think it would be hard to beat what we've seen this week in The State Journal of Frankfort, Ky.
First the newspaper reported that the leading bank in town, Farmers Bank & Capital Trust Co., plans to start repaying the $30 million it borrowed from the Troubled Asset Relief Program, and that its non-performing loans increased from $29 million to $44 million over a six-month period earlier this year, according to the Securities and Exchange Commission. Reporter Paul Glasser also cited a recent report by the bank to the Federal Deposit Insurance Corp., revealing that it lost money in September, after making $4.3 million in September 2008. The editorial continued relating the local situation to the national, saying the bank "is in the same predicament as its customers: Even though some economists say the recession is over, the recovery is too weak to make anyone feel especially secure. [It] finds neither businesses nor individuals are in the mood to borrow much money, which inevitably depresses the bank’s revenue outlook," the editorial continues. "If Americans really have resolved to reduce their indebtedness, that’s not a bad thing. Farmers Bank was established in an era of fewer consumer goods when people found it prudent to borrow only if they really needed to, and vigilant bankers kept them from diving in over their heads. It’s past time for financiers, and the rest of us, to rediscover the proven wisdom of living within our means." That's a frank and helpful look at a town's most powerful financial institution, by a newspaper that has a circulation of only 8,000 and is often considered the "local little sister" to metropolitan papers in Louisville and nearby Lexington. While Frankfort is the state capital, it is not metropolitan; it has a population of only 27,000 and a county population of fewer than 50,000, so The State Journal is still very much a community newspaper. It's owned by Ohio-based Dix Communications and makes its edtorials available online only to subscribers, but Opinion Editor Ron Herron has graciously alllowed the pertinent editorial page to be posted on the Institute site, here. 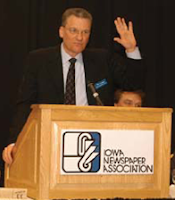 Bill Monroe of the Iowa Newspaper Association, one of the best and longest-tenured state newspaper association executives, is retiring after 29 years. He will be succeded by Chris Mudge, who has been assistant director. In this week's INA Bulletin, Monroe writes that the association is a national leader because its 250 or so newspapers are almost all community papers: "Perhaps because there is no Top 50 market newspaper in Iowa, our members are more alike than they are different from one another. They know they can accomplish much working together. . . . They are willing to contribute to a foundation which, in turn, provides them with top quality training at a very affordable cost." INA probably has the most extensive training program of any state newspaper group. "Our Foundation is the leading state press association foundation, having raised more money in the past three years than any other and exploding the programming options for our members," he writes. We're glad to provide an amplifier as Bill toots the INA horn. Best wishes in retirement, Bill. Bruised by the health care debate and worried about what 2010 will bring, moderate Senate Democrats are urging the White House to give up now on any effort to pass a cap-and-trade bill next yearThe prospect of a final vote on health-care reform early in 2010, and the failure of the Copenhagen climate summit to produce anything close to a binding or global agreement, make it unlikely that the Senate will join the House in passing climate-change legislation, several observers have opined this week. The latest is electric-industry reporter Liam Denning of The Wall Street Journal. Heartland Publications LLC, publisher of about 20 daily newspapers, 30 weeklies and other mostly rural publications, "filed for Chapter 11 bankruptcy protection on Monday after agreeing with its major lender on a plan to cut the company's debt load by more than half," The Associated Press reports. "The company said the newspapers — in Georgia, Kentucky, North Carolina, Ohio, Oklahoma, South Carolina, Tennessee, Virginia and West Virginia — would continue operating as usual." For a Wall Street Journal story by Jacqueline Palank, click here. For Heartland's own story, click here. For a list of Heartland's papers by state, with frequency and circulation data, from the Editor and Publisher Yearbook and the Institute for Rural Journalism and Community Issues, click here. The bill also includes $10 billion for non-profit community health centers, officially called federally qualified health centers, and $4 billion for expansion of the National Health Service Corps, "which provides loan repayments and scholarships for primary care doctors, dentists, nurse practitioners, physician assistants and mental health professionals," both pushed by Sen. Bernie Sanders, an independent from Vermont who caucuses with Democrats, Katrina Vanden Heuvel of The Nation notes. Other winners, as well as losers, are tallied in a list from The Associated Press. For interactive, side-by-side comparisons of the Senate bill with other versions, from the Kaiser Family Foundation, click here. UPDATE, Dec. 23: Differences in the House and Senate bills may be hard to reconcile, writes the Los Angeles Times' Janet Hook, who knows Congress like the back of her hand. UPDATE, Dec. 24: Here's the latest example of that. Vicki Smith of The Associated Press notes that protesters on both sides in West Virginia have been charged with battery and writes: "Both sides are fighting for a way of life. The miners see the mountains as their livelihood. The environmentalists see them as divine and irreplaceable creations."